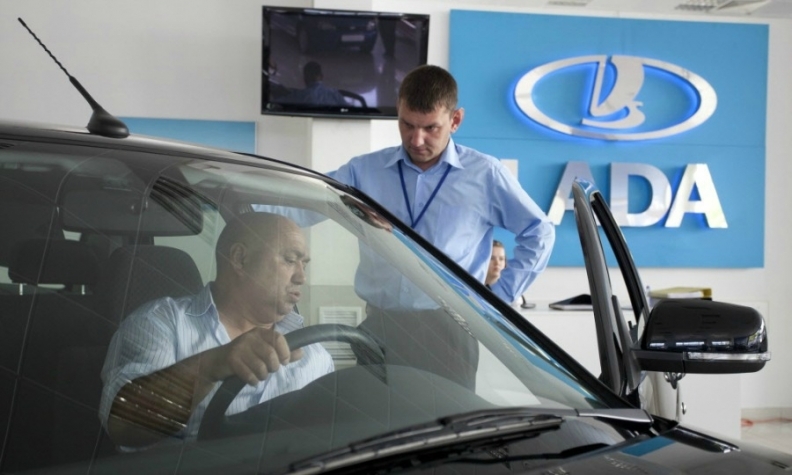 A customer examines a Lada vehicle at a dealership in Moscow. Russian car sales are seen falling for a second consecutive year in 2014. MOSCOW (Reuters) -- Russian car sales fell 6 percent in 2013 and face a second consecutive year of weak sales as a stuttering economy puts off buyers, the Association of European Businesses said. The forecast deals a blow to western automakers that have invested heavily in the country on the expectation it would soon become Europe's biggest car market. The AEB, a lobby group for Europe's top carmakers, said on Wednesday that sales of new cars in Russia fell to 2.78 million units last year, but were boosted by a 4 percent rise in December deliveries to 264,257. The drop in 2013 sales brings to an end three years of double-digit growth in Russia and delays the country's move to succeed Germany as the region's No. 1 market. "Russia will remain in second place in Europe in terms of the volume of the auto market," Joerg Schreiber, chairman of the AEB, said at a news briefing. Car and light commercial vehicle sales are expected to fall by 2 percent in Russia in 2014, the AEB said, giving a central forecast of 2.73 million units within a 2.64 to 2.85 million range. "[It's the] general economic situation, if you look at other consumer goods -- white goods etc. -- everything went down," said Schreiber. "Now it all hinges on -- is there still consumer appetite or not?" A Reuters poll last month showed economists expect Russia's economy grew just 1.4 percent last year due to weak investment and tapering consumer demand. They predicted growth of 2 percent for this year, against the government's forecast of 2.5 percent. The decline in new-car sales last year was reduced by a government loan subsidy program which ran from July to December. The scheme boosted sales in the final month of the year by 4 percent following nine straight months of falls, the AEB said. Schreiber said some of the manufacturers that had invested in Russia may have rethought the scale of their investments "had they known that they would be dependent on state subsidies." Manufacturers have now adjusted their production levels in line with the market, Schreiber added. "Everyone has shrunk to a state of reasonable healthiness and now are waiting for what the new year will bring," he said. "Should demand go up, I'm sure manufacturers will be in a position to quickly replenish." Dealerships have felt a heavy blow from the falling sales and have seen their income hit as they offered larger discounts and increased their marketing spend to lure customers, he added.